If only every Australian woman could have the same height, weight, and body build! That would make it so much easier to buy clothes. Retail owners do their best to offer ready-to-wear products in a variety of sizes, but a lovely women’s suit jacket will usually be either too short or too long, too narrow or too wide. If you happen to be lucky to find something after a long search, the colour may not be exactly right, the fabric may look flimsy, or the price may take your breath away. Suitmeup is your personal online tailor for bespoke womens suits. No matter if you’re at the office, and browsing our pages during a lunch break, or if it’s the middle of the night, we’re by your side. Choosing your favourite design from our supply of custom made womens suits is easy, and enjoyable. Do you need only a tailored suit jacket and shirt, a custom womens blazer, pants, or are you looking for a three-piece suit? Our revolutionary suit builder is your trusted companion to create the perfect attire for you. Notched, peaked or shawl lapels? Hip pockets or breast pockets? How many sleeve buttons? It’s all up to you. Our interactive tool allows you to experiment at leisure with the different options for womens tailored suits. Don’t give up hope of finding clothes to make you look sharp, even if you’re a bit taller, shorter, or rounder than average. 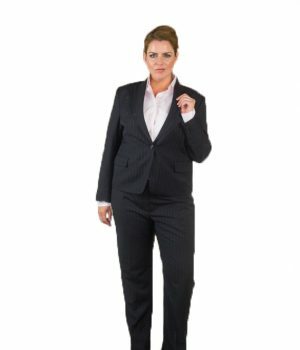 At Suitmeup, we offer plus size womens suits for any plus size, and we really mean it too. You’ll discover there are no sizes; no 14, no 26, not even a 32. Don’t be surprised. In our online tailor shop, there is only one size: yours. Refer A Friend – 10% off for you both!